It’s not very often that we get snow here in San Antonio, Texas – and I can’t say I was one of the excited ones waiting for it. BUT it was a pleasure to look out my window this morning to see the grounds here at The Historic Pearl Brewery covered in a light blanket of snow. I even ventured out in my jammies and hiking boots to get some pictures. 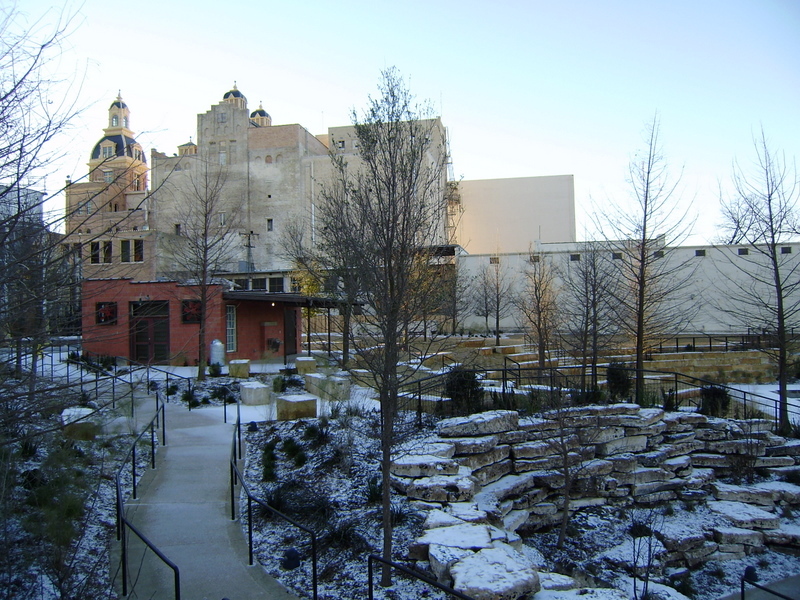 The picture here is of the recently opened Park at Pearl that sits on the bank of the San Antonio River – Museum Reach. I did a little slipping and sliding getting back there to take a few pictures and have more of the other beautiful buildings here on the property. My Facebook friends can check out my album. If you’re not a Facebook friend and want to be, just comment below and I’ll send you a friend request. I post lots on Facebook about what’s happening in Downtown and MidTown San Antonio and especially here at Pearl where I live and work. I’m on Twitter too as @SanAntonioism. Come follow me. I’m a better poster than blogger right now! By the way, The Park at Pearl should look a lot different tomorrow as people fill in and the rest of the grounds here for Pearl Fit Fest. It’s from 9:00 am to 2:00 pm and since the weather is supposed to be beautiful tomorrow I bet it will still go on. Check Pearl’s website for updates and all the details.